To enter, you must complete the form below for a chance to win a $50 gift card toward the cost of cleaning and preserving your wedding gown. Instructions: All personal information fields are required to be completed to qualify for a chance to win. 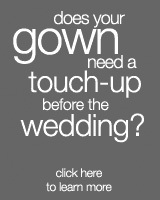 Instructions: Please complete the appropriate information as it relates to you and your wedding gown.